Friday night, I put some meat from the freezer into the fridge to thaw so I would have something to cook this weekend (and not have an excuse to not cook and go out instead!). I had a 2.5 lb package of ground turkey breast that I knew I would be able to use…I just didn’t know how or when. 🙂 Sunday late morning rolled around, and I was craving meatloaf! I haven’t made a meatloaf since before I moved out of my old apartment in April, so this recipe was long-overdue. 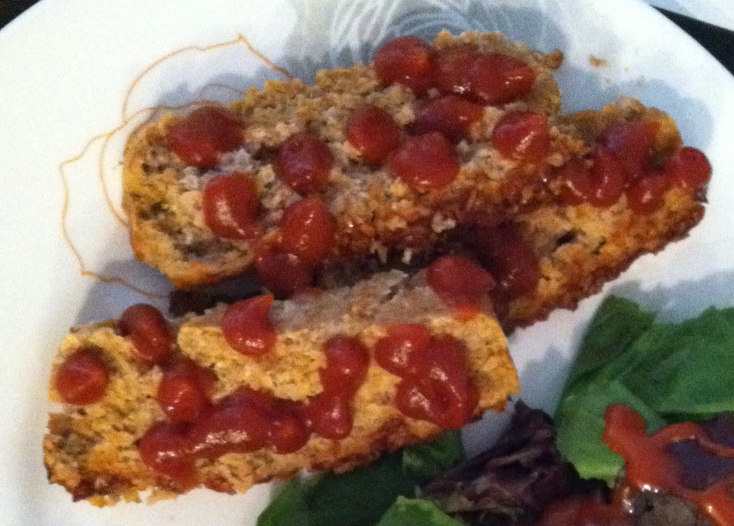 Like any smart lady, I jumped on Pinterest to find the easiest recipe possible for ground turkey meatloaf! Not surprisingly, recipes from the Six Sisters’ Stuff popped up first in my search. I immediately found this meatloaf recipe and knew I would be able to make it fit the ingredients I actually had on hand! 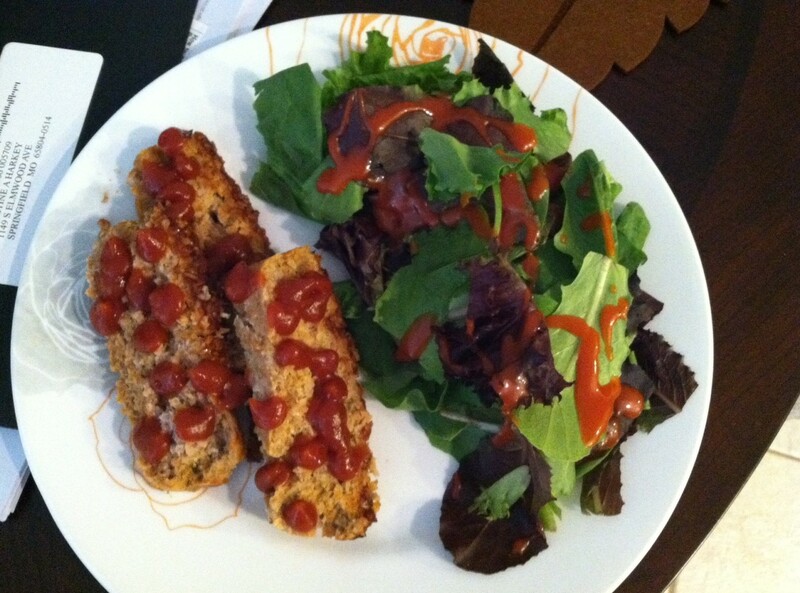 After baking for an hour, I had 3 slices of the meatloaf with a spinach mix salad for my Sunday lunch. It was filling and super healthy. Win-win! Mix together the ground turkey, minced onion, breadcrumbs, egg, 1/4 cup ketchup, garlic salt, onion powder, and salt/pepper. Once this is well combined, spread it into the loaf pan. Mix together the extra 2 tbsp ketchup with the Worcestershire sauce in a separate bowl. Add a few more minced onions to this mix if you want! Spread this sauce evenly on top of the meatloaf. Bake uncovered for around 1 hour/60 minutes. The meat should brown up nicely and start to pull away from the edges of the pan slightly. Let it cool a little before slicing! This loaf was fairly small which is great for the 2 of us. I hate having days and days of leftover meat. It made about 3-4 adult portions – if I had to guess! It also only took around 5 minutes to put together and get into the oven. It would be a great mid-week dinner for busy moms! I followed the original recipe fairly closely and only altered because I didn’t have a few things on hand. It still turned out great! I’m going to try it again soon with BBQ sauce in place of the ketchup. This is how my mom always makes her meatloaves, so it should bring back some memories!